CHICAGO – “Underworld: Rise of the Lycans” is easily one of the weirdest movies of 2009. It’s a werewolf movie that plays like a variation on “Gladiator” or “Spartacus” with the foundation of “Romeo & Juliet”. Solid work by the excellent Michael Sheen nearly redeems the film but an awful screenplay, dull design, and plodding direction sink this bizarre prequel. 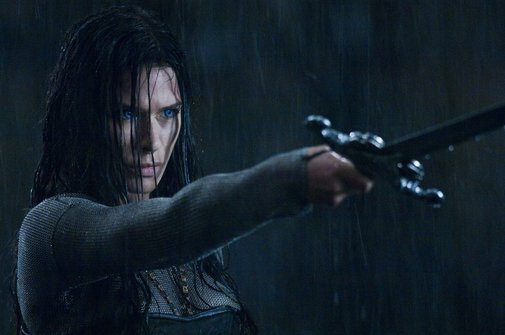 How many people were really concerned with how the blood feud started between the vampires and the lycans that served as the foundation for the Kate Beckinsale “Underworld” films? Enough to spawn this unusual prequel, detailing the history of this centuries-old rivalry. Underworld: Rise of the Lycans was released on Blu-Ray on May 12th, 2009. Lycans used to be slaves for the Death Dealers, the aristocratic vampires led by the vicious Viktor (Bill Nighy). In the Dark Ages, a young Lycan named Lucien (Michael Sheen) develops a romance with Viktor’s daughter Sonja (Rhona Mitra) and leads his kind in a revolution against their masters. Sheen brings an unusual amount of star power to the role of Lucien but he’s fighting a losing war against awful dialogue, incomprehensibly staged action sequences, and poor design decisions. He’s also proof that the argument of one actor raising the game of everyone around him doesn’t always hold true. Mitra is simply horrible in a passion-less, uninteresting role and Nighy chews so much scenery with his over-the-top interpretation that you half expect him to literally gnaw on his throne. Ultimately, “Underworld: Rise of the Lycans” commits a cardinal sin of action movies - it’s as boring as watching bad Shakespeare. Only take a look if you’re a diehard werewolf, vampire, or Michael Sheen junkie. Casual fans of any of the above or even the original “Underworld” movies (which look like “The Matrix” compared to this mess) should stay away. The Blu-Ray presentation of “Rise of the Lycans” doesn’t help the final judgment of the film. Director Patrick Tatopoulos shot the film in almost all dark colors, using mostly blues and blacks. The HD transfer doesn’t help the murky cinematography or overdone color palette but it should have been more crisply transferred. It’s literally hard to tell what’s going on sometimes, although the blame could fall any number of places besides the video transfer. The audio is similarly uninspiring with an average TrueHD 5.1 track. Special features on “Underworld: Rise of the Lycans” include a Script to Screen feature, “The Origin of the Feud,” “Re-Creating the Dark Ages,” Music Video for “Deathclub” by William Control, and a filmmaker commentary. Blu-Ray exclusive special features include a digital copy of the film, “Cinechat,” “Behind the Castle Walls - Picture-in-Picture,” and “Lycanthropes Around the World - Interactive Map”. The special features are not a particularly bad collection of bonus material but they’re offered in the enhancement of such a dull film that they naturally suffer from being pretty uninteresting themselves. ‘Underworld: Rise of the Lycans’ is released by Sony Pictures Home Video and stars Michael Sheen, Rhona Mitra, and Bill Nighy. It was written by Danny McBride and Dirk Blackman & Howard McCain and directed by Patrick Tatopoulos. The Blu-Ray and DVD will be released on May 12th, 2009. It is rated R.